Summers Duracoat blades are available for the Supercoulter and CoulterChisel products and extend service life by up to five times longer than standard blade options. Summers Duracoat blades feature an abrasion-resistant WEAR-TUFF® coating to extend service life. Duracoat blades undergo a proprietary WEAR-TUFF process, developed by Lund Industrial Group, in which the outer portion of the blades is coated with an abrasion-resistant material, consisting of alloy powders, carbides and fluxes. Summers Manufacturing now offers Duracoat blade options for its Supercoulter, CoulterChisel and DT Series Diamond Disk tillage tools. The new blades feature an abrasion-resistant WEAR-TUFF® coating to extend service life as much as three- to five-times longer than standard blade options. Duracoat blades are available in flat, turbo, 13-wave, 8-wave, and 8-wave notched varieties for the Supercoulter and CoulterChisel. These five blade options provide varying levels of residue sizing and aggressiveness to accommodate any tillage practice. The 25-inch, low-concavity blades of the Summers DT Series Diamond Disks are also available with the Duracoat option. Duracoat blades undergo a proprietary WEAR-TUFF process, developed by Lund Industrial Group, in which the outer portion of the blades is coated with an abrasion-resistant material, consisting of alloy powders, carbides and fluxes. This process results in a sharper, harder blade edge that is easier to pull through the soil and less susceptible to damage. 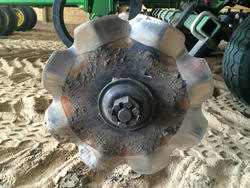 As a result, producers can save time and money by replacing worn or broken blades less often. Summers Manufacturing offers a “Field Tested Tough” line of tillage equipment, sprayers, land rollers, rock pickers and mounted attachments. For more information, contact Summers Mfg. Co. Inc., P.O. Box 580, Devils Lake, ND 58301, call 800-732-4392, email sales(at)summersmfg(dot)com, or visit http://www.summersmfg.com.